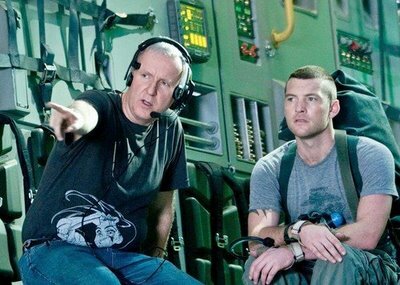 James Cameron has not made a film since Titanic . That was 1997. That was 12 years. What has he been doing? Taking the movies to another dimension. Having pioneered visual effects in The Abyss (the first photorealistic CG character), Terminator 2 (CG plus human actors) and True Lies (composite technology), Cameron is convinced the future is 3-D. And when you’re the King Of The World, you don’t wait for the future. You invent it. Amazingly, Cameron first wrote the treatment for his groundbreaking 3-D sci-fi actioner Avatar in 1995. Unfolding in the distant future on an exotic alien planet called Pandora, it’s the story of paraplegic ex-Marine Jake Sully. After undergoing an experiment to exist in the alien world as an avatar- a 10ft blue genetically engineered biological body, controlled by his human mind – Sully finds himself torn in fight for his own survival and that of Pandora’s indigenous people, the Na’vi. Cameron’s script sets up an epic war between the native race of an incredible world and the human who want to exploit it. Problem: the technology just didn’t exist. People were still getting 3-D glasses on cereal boxes. So he started by working with Microsoft, researching the way people see. He teamed with WETA to develop new motion-capture techniques and photorealistic CG. He made seven deep-ocean expeditions in five years (along with two 3-D IMAX docs) to develop a new 3-D camera technology. It allows Cameron to do something no one has ever done: shoot in live 3-D. Not poke-your-eye-out 3-D, but a totally immersive environment. You don’t see a screen. You see a window. “Sharing a reality,” Cameron calls it. “You’re there. A scene in the snow with two people talking? You’re in the snow. You feel the snow.” Unlike motion-captured, digitally designed characters (like Gollum) or actors motoring animated images (The Polar Express ), Avatar’s process merges a full live-action shoot (real actors, real locations like New Zealand and Hawaii) with an entirely photorealistic CG world (greenscreen in LA), populated by “synthespians” who convey emotion as authentically as humans. But as ever with Cameron’s movies, there’s a beating human heart under the flashing lights and shiny surfaces. As Jake Sully, unknown (at least, until Terminator: Salvation) Aussie beefcake Sam Worthington continues Cameron’s avoidance of megastars. Zoe Saldana, next up as Star Trek’s Uhura, plays his alien love interest. JC fave Sigourney Weaver dyes her hair red to play a botanist who mentors Sully. Michelle Rodriguez, who Cameron has been keen on since seeing Girlfight, is a retired Marine pilot. Support star Matt Gerald (Choke , Magnolia, T3 ) plays the movie’s villain, while ace character actors Giovanni Ribisi (Michael Mann’s Public Enemies) and CCH Pounder (The Shield) pack out a high-impact, low-cost cast. Believe it: the implications are huge. “This will launch an entire new way of seeing and exhibiting movies,” says Fox co-chairman Jim Gianopulos, given Cameron as long as he wants to finished the movie (four years in total). Cameron says he will never make another movie in 2-D. DreamWorks CEO Jeffrey Katzenberg predicts, one day soon, no one will. Avatar has already changed the distribution landscape: the film’s release date was pushed back months to allow 3-D projectors to be installed in cinemas around the world. Potentially? It’s not just a movie, it’s a revolution. For Cameron, current filmmaking is now like “riding a bicycle” compared to sitting in pilot’s seat of his new technology. And if it flies, Avatar will clear the path for back-to-back sequels and a second three-film franchise called Battle Angel about a 26th-century female cyborg. Sure, it’s about aliens. But really, Avatar is about one man’s dream of the future – and how he’s hauled technology into the next century to realise that vision. He began 12 years ago. He’s halfway through the longest post-production period in cinema history. He’s apparently still working seven-day weeks. And loving it.